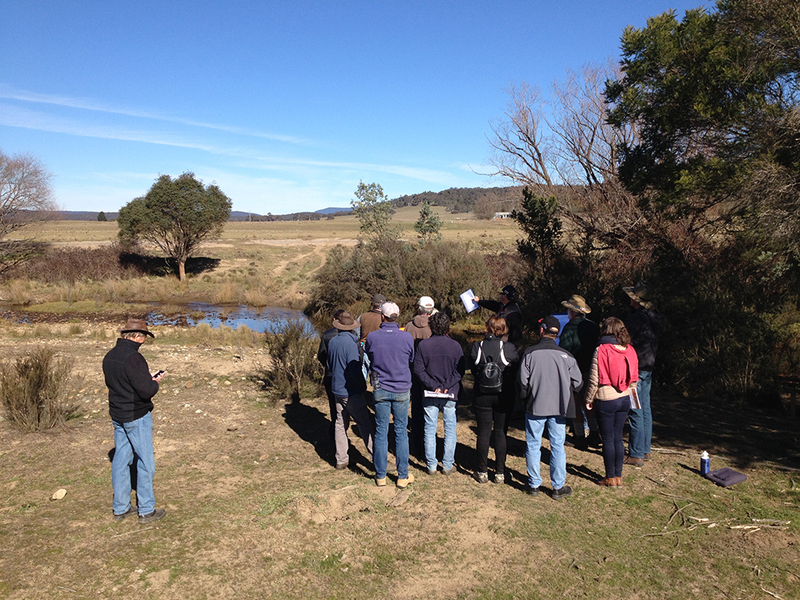 Staff from the NSW DPI Office of Water and DPI Fisheries, along with The Mulloon Institute’s Science Advisory Committee, walked a section of Mulloon Creek with us last week, to better understand the scope of works being undertaken and planned as part of the Mulloon Community Landscape Rehydration Project. The works are part of the MCLRP which aims to build upon results from the successful Natural Sequence Farming pilot project on the MCNF home farm. Tony Coote (founder of The Mulloon Institute) and Peter Andrews (independent landscape thinker) were also on hand to answer questions about the project. It was great to have several landholders there too who are taking part in the project. Their participation in the project and reflections on how it is impacting the creek is invaluable to our work. Overall it was a great day, talking with inspired people about a unique vision for the future of the Mulloon Catchment – one where it is buffered against climatic extremes, with more reliable stream flows, improved ecosystem functioning and enhanced agricultural productivity. Well done to Peter Hazell (MCLRP Project Coordinator) for organising such an informative and well run day.